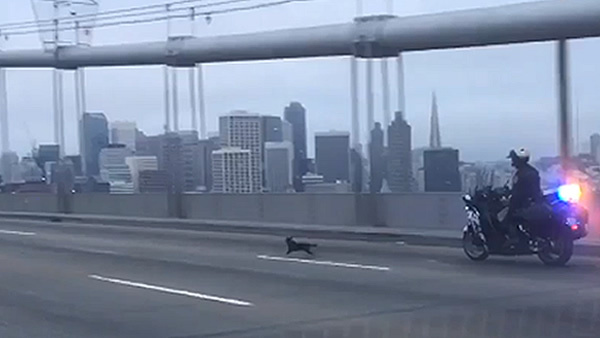 SAN FRANCISCO, Calif. -- A missing chihuahua is now safe after leading CHP officers on a chase down the Bay Bridge this morning. San Francisco County Animal Care officials are watching the chihuahua until the owner calls to pick the dog up. At 6:56 a.m., CHP officials reported a dog running in the eastbound lanes of the Bay Bridge. At one point the dog, described as a black chihuahua, was running against traffic, according to CHP officials. After a brief chase, CHP Ofc. Vu Williams used his jacket to distract and capture the dog. Officers are currently looking for the dog's owner. Anyone with information about the dog is asked to contact (415) 554-6364.